Growth Habit: Erect plant, when mature up to 50cm. Basal leaves from rosette, deeply lobed, margin toothed, short stiff hairs. Stem branched, lower parts have short stiff hairs. Type of Plant: Wild Radish is an extremely competitive annual plant, germinating in autumn and spring, and in summer where adequate rainfall or irrigation is present. The plant forms a rosette to approximately 400mm, then produces erect flowering stems. It is very similar in appearance to, and often mistaken for, Charlock and Wild Turnip. 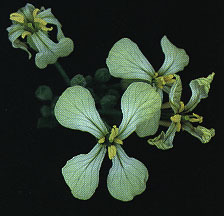 Flowers: Pale yellow, white, or lilac flowers with dark veins. Fruit/Seed: Fruit are long, tapered pods, breaking into 3 to 9 segments when ripe. Seeds are oval, brown and hard. Seeds may remain dormant in the soil for over 20 years. Dispersal: Seeds are disbursed small distances by wind, or by soil movement and disturbance. Seeds may also be transported in harvested material, such as wheat harvested from crops containing wild radish plants. Distribution: Wild radish is one of Tasmania’s most widespread weeds. It is found in a wide variety of crops, as well as being very common on roadsides and waste areas. Young pastures are often subject to strong wild radish competition. Status: Raphanus raphanistrum is not a declared weed under the Noxious Weeds Act 1964. Wild radish can severely restrict the productive capacity of crops and young pastures. In particular it is a major weed of brassica crops, such as canola and turnips. On roadsides it can form dense colonies which restrict all other plants. Young plants may be easily removed by hand or hand tools. Older plants often develop a taproot which makes physical removal difficult. Slashing or mowing are ineffective at destroying the plant, although this may reduce seed production. Herbicides registered for use in Tasmania include glyphosate, MCPA, bromacil, bromoxynil, glufosinate, 2,4-D and dicamba. Note: All 2,4-D products may be used without restriction from 15th April to 15th Sept, however use outside of these times requires a permit available through the Registrar of Pesticides, DPIWE. (Ph: 131368). The herbicides mentioned on this documents may not necessarily be registered for use on the plant referred to.